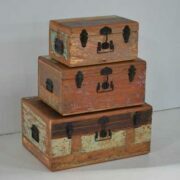 A Vintage teak trunk with a large storage area and 1 extra storage compartment. 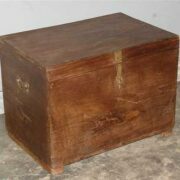 This is one of our vintage teak trunks, generally about 50/60 years old, which make a great storage box for your special possesions. Internally, this one has a large storage space plus a small internal compartment on the left to store some smaller pieces. The feet of this one have been slightly shaped giving the base an attractive appearance. There are little pieces of metal banding around the edges and a brass clasp which would enable the use of a lock if required. There is a handle on each side and a stopper on the back for holding the lid open. It is in good condition.